IU Libraries’ Open Scholarship website, an overview of open scholarship services provided by the Scholarly Communication department, recently underwent a major update. One of the most notable changes to the site is the addition of the Open Education tab, which provides information on the library’s services regarding Open Educational Resources (OER). OER are teaching and learning resources shared under an open license, usually a Creative Commons license, that renders them compatible with the 5Rs of Open Education; they can be retained, reused, revised, remixed, and redistributed in perpetuity and without restrictions. 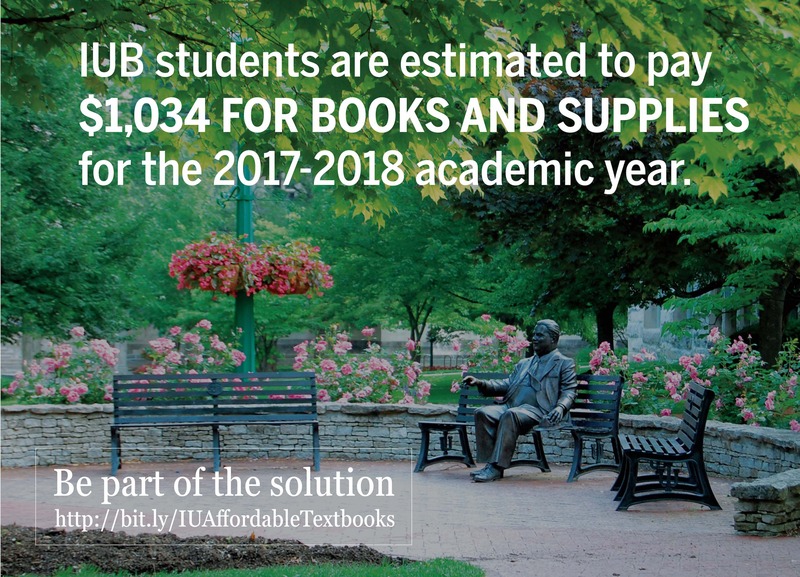 OER provide free course materials to students, which help combat the rising price of textbooks (the average student at IUB spends over $1,000 on textbooks per year). The customizable nature of OER allows them to be closely tailored to specific courses and better reflect current events and new discoveries. While it can difficult to navigate implementing the right OER into your classroom, the Scholarly Communication department can help instructors find, evaluate, and create OER. The following is a detailed synopsis of the new open education tab, intended to help patrons understand the process of incorporating open education and OER into their pedagogy. This process often begins with searching for pre-existing OER to include in your course. There are many ways to approach finding OER. One possible starting point is to search for keywords in conjunction with “open educational resources” in your preferred search engine. There are also several OER repositories that can help streamline the process: the Open Education tab’s “find” subsection provides a list of some of our favorite repositories, and the IU OER LibGuide contains several other suggested resources. The LibGuide also provides access to the Mason OER Metafinder (MOM), which searches across several OER repositories. Often, there are many potentially relevant OER and choosing the right option for your classroom can be difficult. The following section provides evaluation tips and suggestions to make sure you are choosing the most appropriate resources. As OER can be created, used, and revised by anybody, instructors may have concerns regarding their quality and suitability. The process for evaluating OER is very similar to evaluating any other course material; the only difference is understanding each resource’s specific license. The OER Evaluation Checklist provides a walkthrough of considerations when evaluating OER, in particular, ensuring that the materials are of proper quality, appropriate for the class demographic, and are technologically compatible with the course aims. The Open Scholarship website also contains a rubric for evaluating OER that addresses relevance, accuracy, production quality, accessibility, interactivity, and licensing. 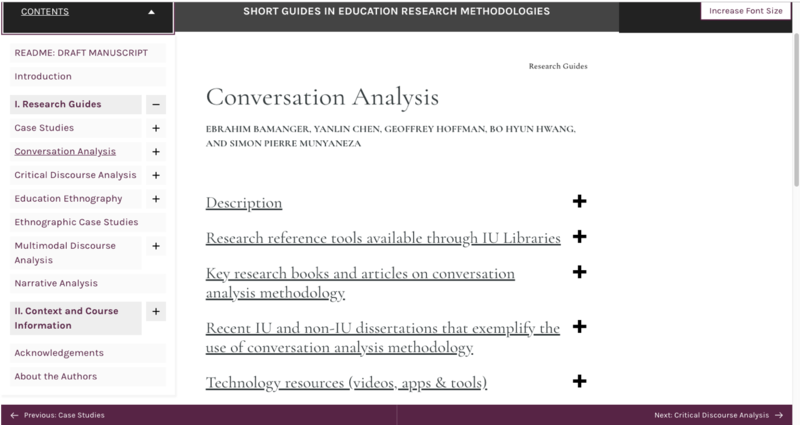 As an additional evaluative tool, many OER repositories include reviews of particular resources from other users, often other instructors, which provide a succinct and critical overview for helping instructors quickly evaluate a particular OER. If you are still having trouble finding the right OER for your course, or are interested in development, the Scholarly Communication department can help instructors create their own OER. Creating an OER for your course can take many forms, and there are several resources available to you. One option is using Pressbooks, an accessible tool that allows users to create, edit, and publish texts in a variety of formats. It is easy to involve students with Pressbooks, and they can even create OER as a final project for a course. The Pressbooks User Guide provides a walkthrough of the tool, and the Open Pedagogy Notebook provides examples and suggestions for creating OER with students. There are even funding opportunities for supporting OER creation and implementation, such as IUB’s Information Literacy Course Grant. For a more thorough discussion of a recent example, please see Scholarly Communication Librarian Sarah Hare’s previous blog post about a course that received an Information Literacy Grant to create an OER using Pressbooks. Not every class is the same, and the steps discussed above are not always linear. The process often includes a combination of different steps. The Scholarly Communication department offers various resources and services to help you integrate OER into your classroom, no matter what your project looks like. A detailed list of these services, including FAQs, can be found under the Open Scholarship website’s new Open Education tab, and the IU OER LibGuide provides supplementary resources and information. While this blog post details the Scholarly Communication Department’s OER services, it does not exhaust all available options for finding, implementing, and/or creating affordable course materials at IU. If you have any further questions about OER and how you can incorporate them into your classroom, please email iusw@indiana.edu.